May 12th, 2017 by Conor Murphy in Big Fish News. 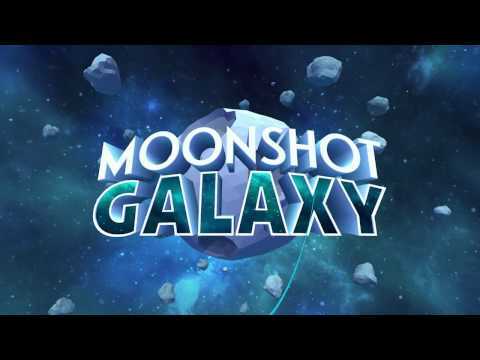 Liftoff Labs and Big Fish Games are excited to announce the launch of Moonshot Galaxy™ on PlayStation®VR and Steam. 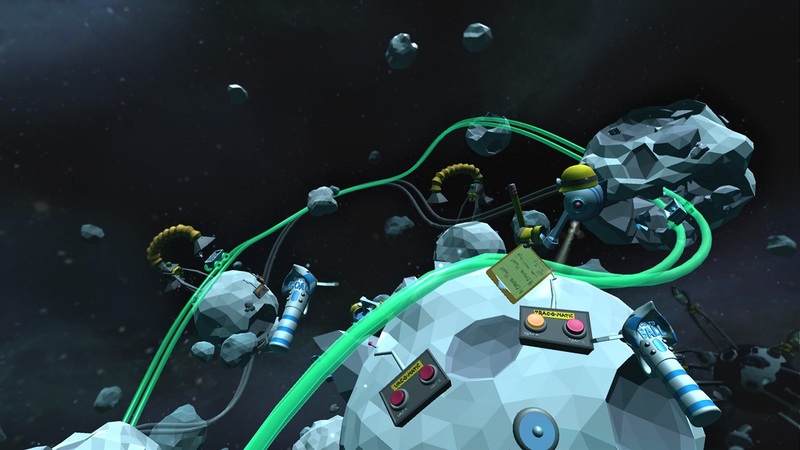 Moonshot Galaxy™ is a unique VR puzzle game offering accessible gameplay infused with charm and style. 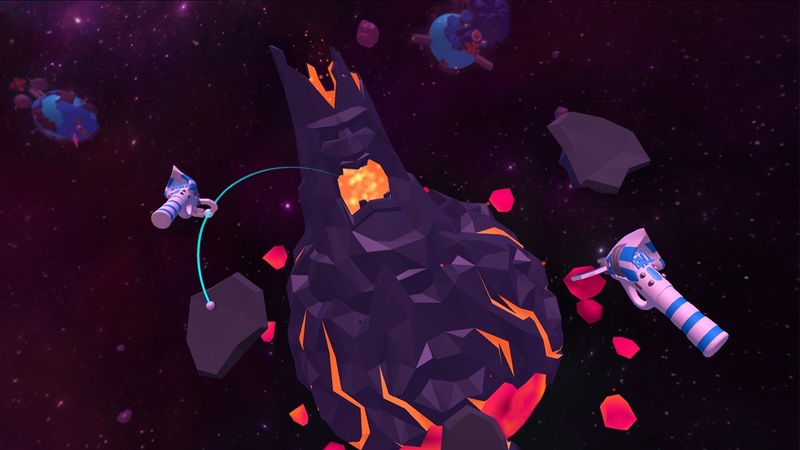 Easy to pick up but difficult to master, Moonshot Galaxy™ has endless replayability for VR newcomers and seasoned vets alike. In Moonshot Galaxy™, players navigate a series of mini-planets in unique quadrants of the Universe. Each planetary system has a distinct look and feel with diverse color palettes to delight your senses. The concept is familiar: get the ball into the hole in as few shots as possible. That’s where the golf similarities end though, as there are no clubs in this game. Using VR motion controllers, simply pick up the ball, aim, and let it fly. A keen eye for curves and trajectories is useful for this galactic challenge. The feeling of navigating miniature worlds and striving for the perfect shot is extremely compelling and keeps players coming back for more! Moonshot Galaxy™ is available now on Sony PlayStation®VR and and Steam (Vive and Oculus). From Left to Right: Moonshot Mining Co., Pleasant Hills, Frosty Brimstone, Forbidden Island. Moonshot Mining Co.: This course has an industrial feel with monotone planets, and a few burst of color with fun tracks and contraptions. This level has very different challenges and some Rube Goldberg-ish devices. Pleasant Hills: Has a pastoral vibe with cool colors, greens and blues, with grassy hills and gentle shorelines. Forbidden Island: Pinks, purples, reds and blues can be found in this tropical tiki themed course. You will battle an angry volcano in the last level that will challenge even the best of players. Director of Liftoff Labs, Mars Jokela was kind enough to do an Ask Me Anything (AMA) on Reddit a few days ago and we wanted to share that content with our blog readers who may have missed it! What made you guys decide that this was the game you wanted to make in VR? When we started looking at making VR games we started with Gear VR because it had a good install base and was accessible to a lot of people (PSVR wasn’t out yet). That headset has some technical and design constraints (no position tracking, no hand controllers at the time, no guarantee of a gamepad). But VR adds some important new design factors: very accurate head tracking, so aiming games work well, and depth perception because you have binocular vision. So we thought about what games would leverage those strengths, and what could set our game apart. I wanted replayability, and precise aiming, and to avoid shooting games if possible just because there are plenty of people making those already. So golf was a good fit for those goals, but we needed something else to make it unique. Exploring spaces in VR feels great, especially uniquely designed places that you’d never experience in the real world. We’re all fans of Super Mario Galaxy and it just seemed like exploring mini planets in space would be really compelling. Putting the two together made a lot of sense! 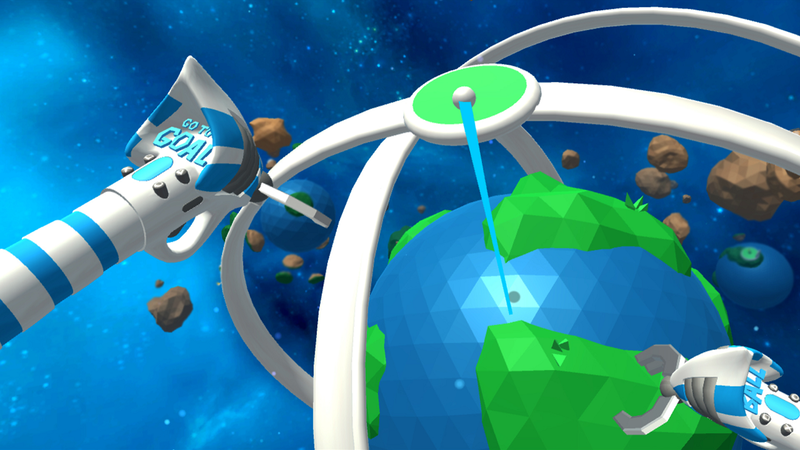 Once we decided that’s what we wanted to make, it took quite a bit of iteration to get the controls feeling good on Gear VR, and then when we decided to bring it to the Vive, adding motion controls took the game to another level. It was at that point that I felt we should double down on it, build more courses, and bring it to PSVR. How much playtime are we looking at for a play through of all the courses? I’d guess about 1-1.5 hours to make your way through each of the courses the first time, but in a golf scoring game your first playthrough is going to be a struggle, and if you want to score better it’s going to take practice. Especially since you’re learning a new type of orbital shot physics. We have trophies to earn and leaderboards you can climb if you’re completionist or competitive. If you’re trying for those it’s going to take a good amount of play time. I still have fun myself, trying to improve my scores. When you think about designing games for future projects at Liftoff and BigFish, do you think now exclusively in terms of what you can create for VR? VR is still a huge wide open field in terms of design, and our mission as a studio under Big Fish is to explore it! We are also thinking about what future platforms are going to bring, such as AR/MR devices and whether our games will translate to those kinds of devices. So “Putt Putt in Space” is my reaction when seeing the trailer. Is that fair (because that sounds great)? How does VR effect the experience? I’d say that’s a fair one-liner. It’s pretty much the core idea that led to the game. We try to avoid calling it “putt-putt” or “mini-golf” though because in VR with motion controllers, people basically expect mini-golf clubs (like Cloudlands, which is an awesome game). But there are a ton of games on Steam like that, and our game is quite different from that picture that comes to mind, so we try to think of it differently as well. The game was designed for VR from the ground up, and VR is critical to the experience, because of the depth perception you get in the headset. Whenever I try to play on a flat screen I just can’t judge the shot as clearly as I’d like, which is why we are releasing it for VR only and not putting out a flat screen version. How long did it take you guys to create the game? Also what were some of the biggest challenges with creating a VR game, juxtaposed to a normal PS4 title? We’ve spent about a year and a little more on the game, most of that time being adapting it for multiple VR platforms with different control schemes, and then doubling-down on the game and building these two new courses and targeting PSVR. Challenges with creating a VR game – VR is brand new and it’s a very different design space to think within as a game designer. You have to think about things that were never problems before (player comfort), all new controls with motion controllers, the kinds of player interactions you can support are very different from flat screen games, and performance considerations are pretty huge as well. But you also get the huge benefits of what VR is good at, and it’s fun to leverage those qualities while working within these new design constraints. Personally, I don’t want to go back to designing mobile games! Will Moonshot Galaxy Have Level Creators? We don’t have support for building your own planets in the game now, but it’s something I really would have loved to include. 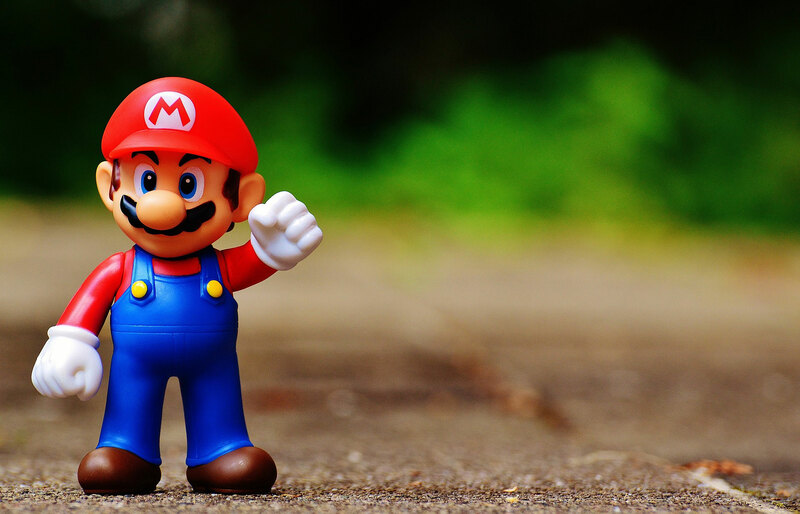 Unfortunately, it’s a huge amount of work and you really have to structure your game around it, so you almost have to bet on it as a feature from the very start. Does it support multiplayer, or just leaderboards? It’s single player with leaderboards. I love playing multiplayer VR games, but the reality as a developer is that it takes a ton of time and effort to make multiplayer work well, and at this point in the hardware cycle we weren’t sure we’d have enough of a player base to support the experience. I don’t have a hard number for sales targets, even internally; we understand as a company that VR is still in the early stages and we’re not likely to turn a profit on it just yet. But we’re here to build experience and expertise in making VR games, which includes learning about and shipping on all of the major platforms, so that we can be in a position to succeed when VR really goes mainstream. I think that time is coming soon. Is it exciting to be getting in on that first wave of VR? Super exciting to be working in VR right now! My whole career I’ve worked on interesting new hardware and platforms, but I can say that this transition into VR has been the most compelling so far. Nausea is indeed a huge concern of ours and from the get-go we made sure we were not going to cause discomfort in our users. And we’ve gone to huge lengths to make sure of it, more than you might expect when you just see a little planet floating in front of you. One of the crazy things about this game is that under the hood, the planet is actually fixed in place in world space, and the camera rig, skybox, and environment all pivot and translate around the planet to maintain the illusion that it’s just the planet moving. When you throw the planet ahead of you, you are really throwing yourself and the rest of the universe backwards! I agree that crowdfunding probably has an important role in the short and mid-term for VR developers. We haven’t really looked at it ourselves because it’s a huge amount of work in and of itself, and we do have the support of a major games company behind us, Big Fish. We’re extremely lucky to be able to explore this space right now, while the VR market is finding its legs, so to speak. How did you get the idea of using the move controllers to move the planets position and use it as a put or way to move the ball? Moonshot Galaxy™ is available now for PlayStation®VR and on Steam for HTC Vive and Oculus Rift. Coming soon to the Oculus store.